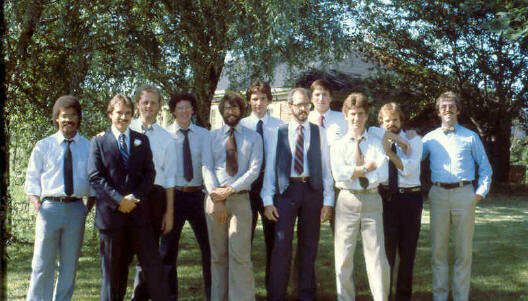 One of Jon's classmates found this photo - circa 1980 or 1981 - from another of his classmates' wedding. These gents are from the UC Architecture class of 1980. None of us has changed a bit over the past 20+ years! Jon is the hairiest of the bunch. On January 3ed we had our first dinner party of the new year with friends Ron and Mel and Bob and Cari. Immediately after the holidays, Jon took a business trip around the world - the UK, Germany, and China in two weeks.